Come stay in this magnificent home that has everything you’ll need to enjoy a peaceful and pleasant vacation. With its warm, inviting colors and tones and sun-kissed interior, this ideal mountain cabinlures its guests to enjoy its sublime comforts. The living room features vaulted ceilings with exposed beams, flat screen television with cable options, large all in one entertainment PC, comfy leather sofa and freestanding wood burning stove. Since the living room is over-sized and spacious there’s also a separate area that’s set up as an office area or a computer play space for the kids the kids that also has a Murphy bed. There Off the living area is a separate dining space with a large oak dining set with seating for seven plus three more spaces at the adjacent peninsula breakfast bar. The kitchen has plenty of counter space and all the basic appliances one would need. The kitchen sink overlooks the back yard and deck which can be accessed from the dining room. Equally inviting is the home’s expansive, sunny patio, which offers a perfect setting for sun-bathing, dining alfresco, or simply enjoying the grandeur of the property’s beautiful swaying pines and peaceful setting. With over 500 square feet of elevated deck space the leisure options are limitless! There’s also a grassy lawn down below with a lovely water feature that’s to be enjoyed in the summer. The lot sits adjacent to forest conservancy land so, the forest is literally out your back door! 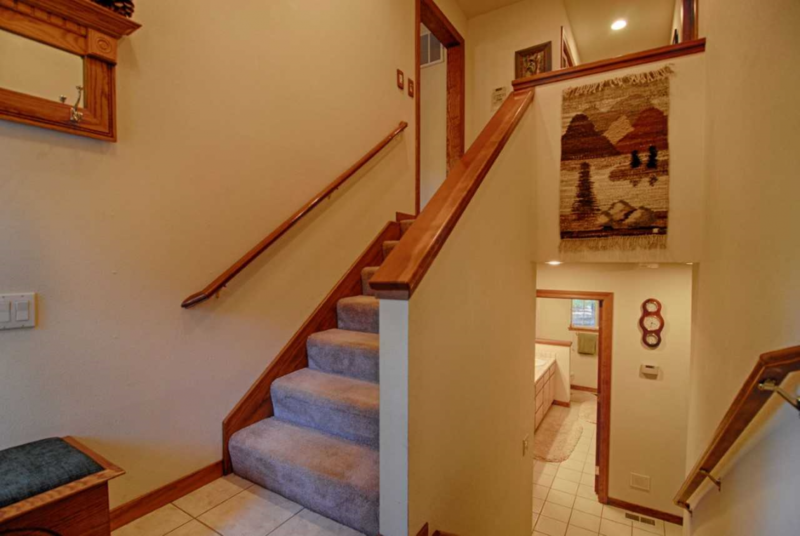 Home is divided over two levels with the master bedroom upstairs. This expansive bedroom has a plush queen mattress on a sleigh bed, large bay windows, a walk-in closet and a en-suite master bathroom with walk-in shower with jetted tub and double vanity sinks. The downstairs sleeping arrangements are two bedrooms and a shared hallway bathroom with tub. 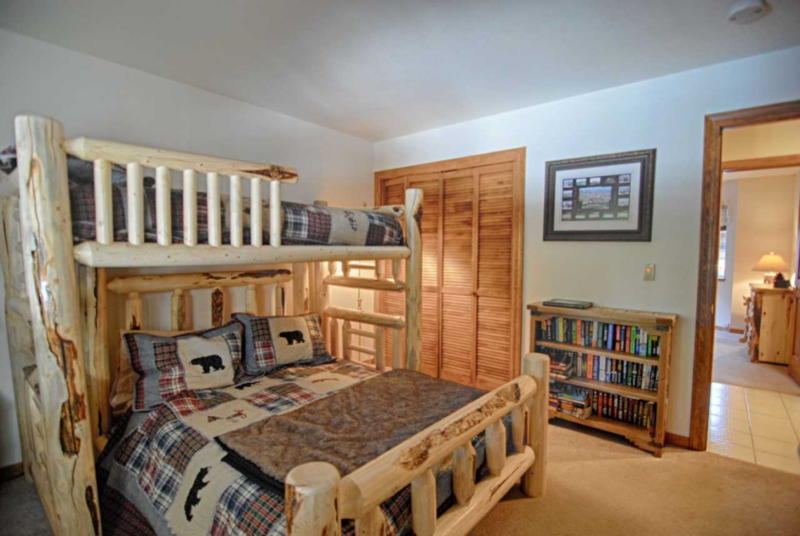 The first bedroom has a log pole bunk bed with a double on bottom and a twin up top. This room overlooks the back yard. The other bedroom has a another queen bed and a bay window for plenty of natural light. 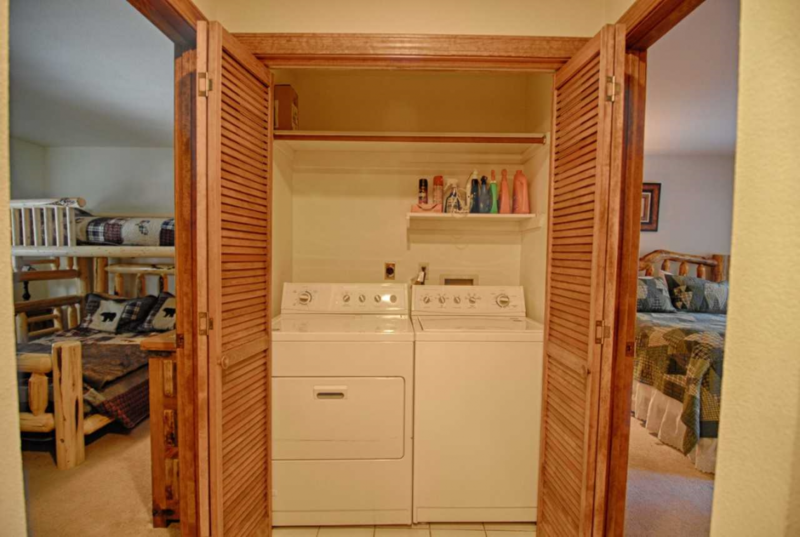 There is also a fold-out twin bed in the hall closet. Home sleeps 9 comfortably. Pet friendly with additional pet fee. In addition to the above, home has a two car-garage for ski, sled and bike storage. There’s also plenty of additional parking on the flat and paved driveway. With its ideal location, this home is a a short stroll, bike, or drive from Kings Beach’s restaurants, shops, and lakefront park, beach volleyball courts, lakefront basketball court and Safeway. The backyard has direct access to the trails of the North National Park with more than 100 acres of National Forest and a short drive to Northstar and Diamond Peak ski resorts. The home’s mountain-casual interior is matched by Tahoe’s year-round outdoor fun. This home was perfect for our family getaway. Spacious and comfortable, and pets allowed! Had room for kids to play outside as well. 3 minute drive to Safeway,and other shops and restaurants also quick drive to sled hill which the family loved. The house was spacious and cozy and had all the amenities we needed to bunker down during a snow storm. Not only that but the backyard was perfect for snow activities! So much space... we were able to create our own little snow run for the kiddos to use their sleds on. We really had such a lovely time and would definitely stay again! Host was very helpful and responsive throughout our stay. Charming North Lake Tahoe Home! 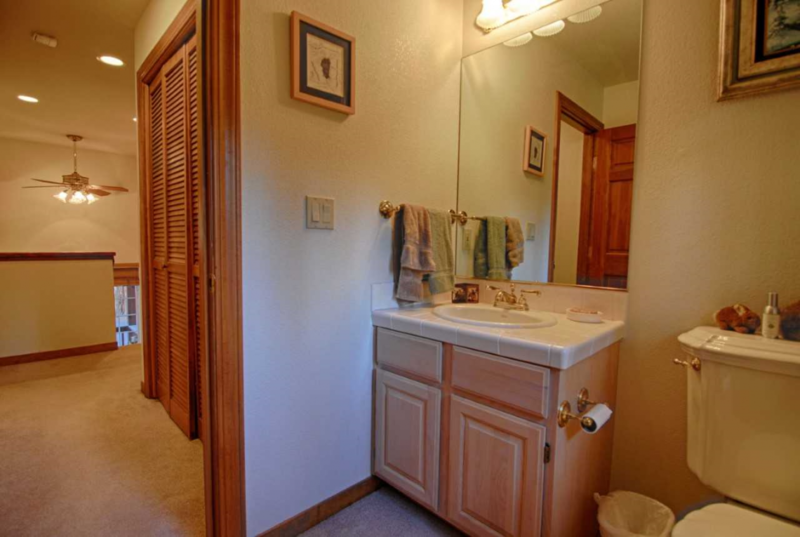 This large, clean, charming 3 bedroom home met all of our groups expectations and needs. It is close enough to Kings Beach on north Lake Tahoe to enjoy the shops, restaurants and grocery shopping a family needs, but far enough from roads to enjoy the peace of nature - it backs onto a national forest which was a perfect place to go for winter walks. The location is very close to Northstar ski resort and about a 30+ min drive (depending on traffic) to Squaw Valley and Alpine Meadows ski areas. Close enough to explore quaint Tahoe City and the sights that the north Nevada side of the Lake has to offer. The kitchen was well stocked with dishes and cooking utensils- everything needed to make a holiday meal. Our family of 7 thouroughly enjoyed our stay and would not hesitate to recommend it or return in the future. Two things to note: this home is not accommodating for anyone with mobility issues: stairs to the front door and back deck and from the garage/lower level to the main living area, and the garage door had to be lifted manually. Very nice comfortable house. 15 min drive to Northstar resort, 5 min to the King beach and close to grocery stores. And it's very pleasant to take a walk in the national forest just behind the house. Perfect Home for a Weekend Retreat! We loved our stay at the chalet. Immediately felt comfortable and at home upon our arrival. Clean, rustic living area with a well equipped kitchen. Quiet!!! Direct access to the national park trails from the back yard , walking distance to King's beach. Very convenient if you have a four-legged friend! The drive into town was a breeze with shopping and great restaurants available. Love this place. Will definitely be back . We called it the “comfort home” because it was set up for coziness and ease. From the Nest thermostat to the kitchen stocked with appliances to the spacious living room and enclosed deck, we had everything we needed. If you have a dog or like to go for walks, the National Forest is literally outside your back door. Walk down a trail from the backyard and you’ll quickly come to a paved path where you can walk for miles. You’re also close to the Tahoe Rim trailhead and the Safeway in King’s Beach is less than 2 miles away. We had a great experience with Tahoe North Rentals whose staff was professional, responsive, and accommodating. We’d love to stay here again or at another Tahoe North Rental property. This is a great cabin, it opens up to the forest in the backyard, and has easy access to a paved path that runs through Tahoe Vista to a regional park. The cabin is well appointed, master bedroom upstairs, two bedrooms downstairs, and foldable full size bed in living room. The kitchen has everything necessary for cooking all meals, there is a washer/dryer, and two car garage. The cabin is located a short drive away from Kings Beach and Safeway. We had a great time. This was a great house for my family and friends for a birthday celebration! The house as plenty of bedrooms and a Murfeys bed for everyone to sleep. Love the big patio and backyard area! I really appreciated that it was doggie friendly, my pup really enjoyed coming with us and having good space to play. Would definitely rent this house again! We had the pleasure of being the first guests to stay in this home which recently transferred to new ownership as a vacation rental. It's nicely appointed and has lots of great space for kiddos and adults alike. We stay in Tahoe multiple times a year and this was our first rental with a garage. That was fantastic as we happened to arrive in a huge snowstorm. This made getting to and from the slopes a breeze! The kids enjoyed the yard and deck (which were both covered in fresh snow) and mommy enjoyed the large soaking tub in the master suite. We would love to stay here again!